About Us - Vegas Time Associates, Inc.
About Us – Vegas Time Associates, Inc.
Vegas Time Associates, Inc. is a Virginia corporation, which specializes in planning and conducting casino theme parties in Virginia, Maryland, D.C. and beyond. We provide top-of-the-line, high-quality casino equipment and courteous, professional dealers who are trained to help your customers and guests understand and play all the various casino games correctly. We work throughout the mid-Atlantic region and have been in operation for more than 40 years. We are licensed, bonded, and insured. Vegas Time Associates does not charge for supplying our clients with Certificates of Insurance (COI). Please keep in mind that some casino vendors do not carry all the proper insurances and some casino vendors charge for copies of the COI. At Vegas Time, casino parties are not a sideline. 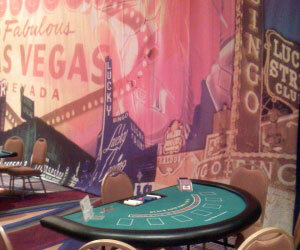 Our staff of full-time professionals are dedicated solely to the production of successful casino theme parties. Our extensive equipment and dealer resources permit us to run multiple parties simultaneously or provide equipment and dealers for very large parties beyond the capability of other casino theme companies. In addition to the readily familiar casino games such as Craps, Roulette, and Blackjack, Vegas Time also has a wide variety of specialty games rarely available outside of casinos. These include IGT slot machines, Red Dog, Minibaccarat, Pai Gow Poker, Spanish 21, and genuine, licensed “Let-It-Ride” and “Caribbean Stud” tables with an electronic, progressive payout feature. Our customers include large corporations, which use our services for employee appreciation events, training programs, and customer entertainment. We work with area hotels providing entertainment for conventions and meetings, with civic groups for fundraising efforts, and with private individuals for purely social events. We have the flexibility to handle such events ranging from small parties to groups of several thousand people and take great pride in tailoring our party format and services to accommodate the customers’ specific needs.